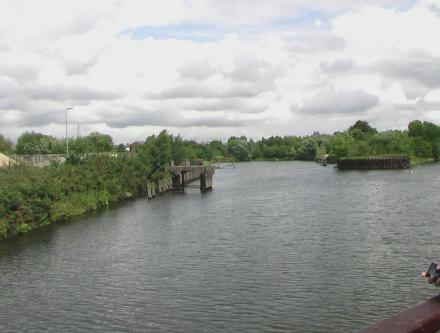 Walton Junction is a major waterways place minor waterways place place on the waterways major waterways place village town city at the junction of the Manchester Ship Canal (Walton Lock Branch) with the Manchester Ship Canal (Main Line). Irwell Navigation Junction (Junction of the River Irwell and the Walton Lock Branch Canal) is on the Manchester Ship Canal (Walton Lock Branch), 3¼ furlongs and 1 lock to the west. Bridgewater Canal Junction (closed) is on the Manchester Ship Canal (Main Line), 7 miles and 1½ furlongs to the west. Pomona Dock No 4 (Junction with Branch to Bridgewater Canal) is on the Manchester Ship Canal (Main Line), 16 miles and 3¼ furlongs and 4 locks to the east. The nearest place in the direction of Irwell Navigation Junction is Walton Lock No 1; ½ furlongs away. The nearest place in the direction of Bridgewater Canal Junction (closed) is Chester Road Swing Bridge; 1½ furlongs away. The nearest place in the direction of Pomona Dock No 4 is Northwich Road Swing Bridge; 3½ furlongs away. Grappenhall Rd, Warrington, WA4 2AF — 819 yards to the east. Unit 1 & 2 Victoria Square, Grappenhall Road, Warrington, WA4 6LG — 897 yards to the east. 381, Wilderspool Causeway, Warrington, WA4 6RS — 883 yards to the northeast. Unit 4, Victoria Buildings, Grappenhall Road, Stockton Heath, Warrington, WA4 2AG — 863 yards to the east. 25 Walton Road, Warrington, WA46 — 797 yards to the east. Warrington, WA4 6HL — 700 yards to the northeast. 3 Victoria Buildings, Grappenhall Road, Warrington, WA4 2AG — 967 yards to the east. Warrington — 1289 yards to the north. 24 London Road, Stockton Heath, Warrington, WA4 6HN — 781 yards to the east. Walton Hall Park, Warrington, WA4 6 — 1371 yards to the southwest. 96 London Road, Warrington, WA4 6LE — 854 yards to the east. Unit 4 , 240 Cygnet Court, Centre Park,, Warrington, WA1 1 — 1271 yards to the north. Warrington — 1358 yards to the northwest. Warrington — 728 yards to the northeast. Warrington, WA51AD — 1634 yards to the northeast. Centre Park, Warrington, WA1 1QA — 1442 yards to the north. Warrington, WA4 — 780 yards to the east. 770 Mandarin Court, Warrington, WA1 1GG — 1176 yards to the northwest. 777 Mandarin Court, Warrington, WA11GG — 1176 yards to the northwest. Warrington — 885 yards to the east. Warrington — 846 yards to the east. London Rd, Stockton Heath Unit 6, Warrington, WA4 6SG — 853 yards to the east. Warrington — 1388 yards to the northeast. Walton Lea Rd, Warrington, WA4 6 — 1559 yards to the southwest. 109 London Road, Stockton Heath, Warrington, WA4 6LG — 887 yards to the east. 34-36 London Road, Warrington, WA4 6HN — 778 yards to the east. rydal avenue, Warrington, WA4 6AT — 715 yards to the north. Warrington — 1173 yards to the north. Warrington — 1464 yards to the northwest. 19 London Road,Stockton Heath, Warrington, WA4 6SG — 806 yards to the east. 66 Chester Road, Warrington, WA4 6AD — 1252 yards to the north. Bernard Avenue, Warrington, WA4 3BA — 1453 yards to the southeast. 18 Freyer Avenue, Warrington, WA4 6FF — 762 yards to the southeast. Unit 4 240 Cygnet Court, Centre Park,, Warrington, WA1 1PP — 1284 yards to the north. Unit 4 240 Cygnet Court, Centre Park,, Warrington, WA1 1PP — 1281 yards to the north. Kingsway north, Warrington, 127 — 1514 yards to the northeast. Warrington WA1, Warrington — 408 yards to the northeast. walton gardens, Warrington, WA4 6SN — 1288 yards to the southwest. 138 Loushers Lane, Warrington, WA4 2RH — 1601 yards to the northeast. 1158 yards to the north.